At last this SRE project is complete ! There are three type of roses in this SRE , spider web, spiral and folded .I have tried fabric painting leaves and stems along with ribbon embroidery to fill up the design . Its better to paint and then do the ribbon work. Spider web roses are in pink, spiral ribbon roses are in red and white, the tight pink buds are folded half -made roses. Spider web roses are so easy to make and look fabulous. Spiral roses need nifty needle -work and require some practice to manage ribbon as well as needle and thread together as one has to stitch each spiral as its made on the cloth . 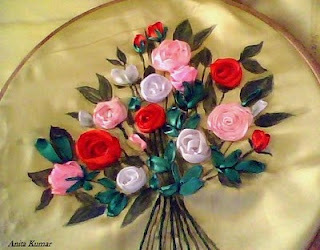 Folded roses can be made beforehand and stitched on to the cloth. The leaves and smaller buds are ribbon stitch . Out of all the three type of roses I feel that the Spider web roses win hands down as they are very easy and beautiful.